Companies across the UK and EU27 are suddenly realising there are now just 30 working days until the UK will likely abandon its 45-year trading relationship with the EU, and start to trade on WTO terms. Scotch whisky exports to Korea worth £71m ($90m) a year, risk a 20% tariff after 29 March if the EU’s Free Trade Agreement is replaced by WTO rules. It is now too late to export by boat, causing some exporters to use expensive air freight to beat the deadline. But capacity is already almost full. Many banks, insurance companies and asset managers have already moved staff from London into the EU27. They cannot risk waking up on 30 March to find they can no longer serve customers from London, because they have lost the essential EU “passport”. “CE Marks” issued in the UK will no longer be valid in the EU27 after No Deal – making it difficult to sell any goods that need safety, health or environmental approval. And last week, BASF’s UK MD, Richard Carter, told Ready for Brexit that for the world’s largest chemical company: “The thought of having to re-register with a UK REACH equivalent if there is no deal and if there is no recognition equivalence is a huge concern”. But surely, you say, “this cannot happen”. 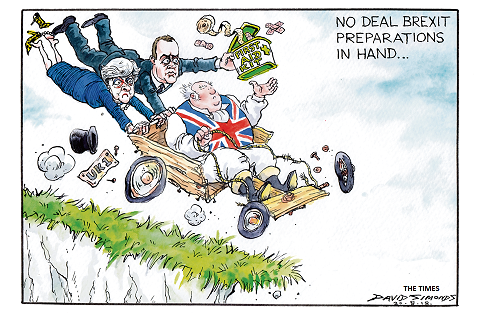 After all the UK’s main business organisation, the Confederation of British Industry, has already warned that No Deal would create “a situation of national emergency“. But the leading Tory Brexiters don’t believe this. Their 111 votes, combined with the 10 votes from the Democratic Unionist Party, meant premier May’s Withdrawal Agreement was defeated by 230 votes last month. It would have provided a Transition Agreement until the end of 2020. However, their votes then swung behind her to defeat the motion of No Confidence in the government, which would have led to a general election. Why did they do this, you might ask, given they had just voted against her key policy? The answer is that the Brexiters have a completely different view of the Brexit negotiations, as I noted in The pH Report last year. In their view, the best way to force the EU27 to offer a better deal is simply to leave on 29 March. The alternatives to No Deal are now also extremely limited. The Caroline Spelman/Jack Dromey resolution to block No Deal was passed last month by 8 votes. But it was only a resolution and has no legal force. Of course, Parliament might change its mind and decide to vote for May’s Agreement. Or the government might revoke its Article 50 notification before the UK leaves on 29 March. But both would split the Tory and Labour Parties and are unlikely to happen. The government could also decide to hold a second referendum. But again, this would split both parties and is unlikely. The only other option is for MPs to effectively take over the government by demanding that it stops No Deal. It is not clear how this could happen, but presumably they could pass legislation demanding that May asks Brussels for a lengthy extension to Article 50. But such a move by Parliament has never happened before. It would need key Ministers such as Chancellor Philip Hammond to vote against their own government. It would also need support from enough Opposition MPs to overcome Brexiter resistance. It would also risk a constitutional crisis, as it would replace an elected government. And in terms of practicalities, it would presumably also mean that the UK would take part in the EU Parliament elections, as it would still be a full EU member in May. The whole process would take the UK into completely uncharted water. Anticipating this risk led me to co-found Ready for Brexit last year, to help businesses navigate the challenges and opportunities created by Brexit. It is effectively the one-stop shop requested recently by the CBI. It provides curated links to all the areas where you may need to urgently prepare for Brexit. 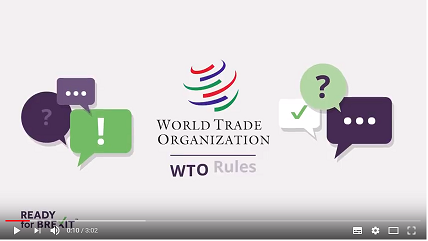 The video explains what WTO rules could mean for your business. Please watch it now, and then decide if you need to start planning today for whatever may happen on 29 March.